Millions of people were able to get their hands on one of the new iPhones last week, and the gradual global rollout continued today with 20 more countries – one of which was the Netherlands. A crew from local TV network SBS6 was filming the launch outside the Amsterdam Apple Store, when a chap on a scooter zooms past and grabs an ‘iPhone’ from a guy’s hand during his interview. 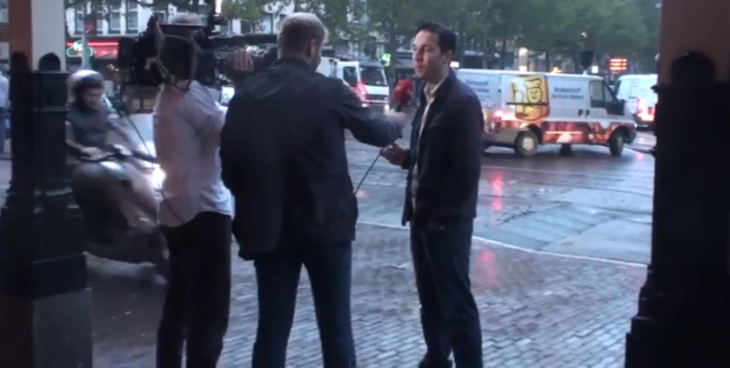 The man being interviewed was from the website iPhone6.nl, the same team that glued a fake iPhone 5 to an Amsterdam sidewalk back in 2012 and filmed the resulting shenanigans for a prank. Indeed, the phone in his hand today was a fake too, as they were planning on carrying out the prank yet again, but when filming for a slot on tonight’s evening news, an opportunist seized the moment and grabbed the device. However, with their prior history in the field of practical japery, it may suggest that this ‘thievery’ was a promotional stitch-up too. If it’s not a prank, then someone just stole a perfectly fake iPhone 6. Anyway, we’ll let you be the judge.